Miss Manners hasn’t written the handbook on how to be a good guest blogger. Yet, anyone who manages an organization’s blog likely has run into guest bloggers (or wannabe guest bloggers) who focus too much on the “blog” part and not enough on the “guest” part. If your content marketing strategy includes guest blogging, you’ll set your efforts up for success if you (or your writer) understand how to be a good guest. Following your host’s lead is the key to being a good guest at someone’s home, and the same applies to guest blogging. 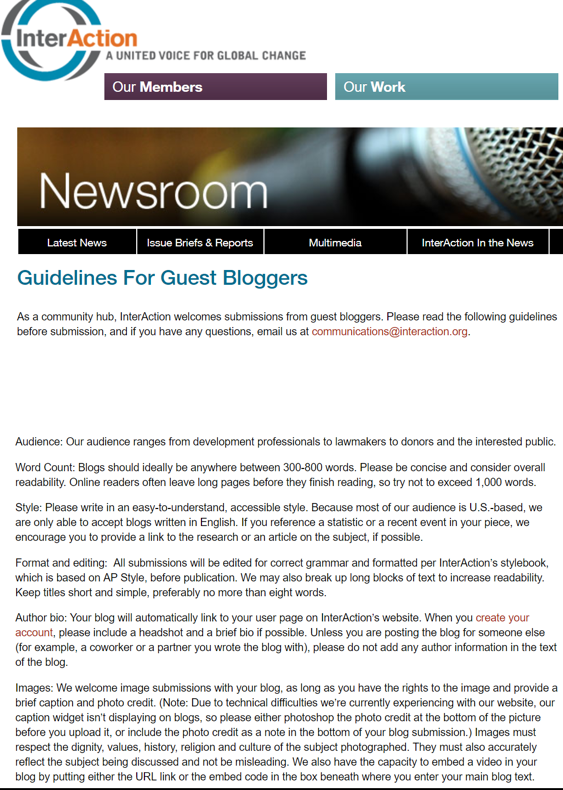 But there’s a unique golden rule for guest bloggers: Read the guidelines. Reread the guidelines. And when you think you’re done, use the guidelines as a final checklist. Now, keep reading to learn more tips, from the deceptively simple to the complex, about how to be a successful guest blogger in the eyes of your potential host. Guest blogging is an excellent opportunity for your content marketing strategy to extend your reach beyond the four virtual walls of your brand. It gets your content in front of fresh eyes, secures quality backlinks from authoritative domains, and increases your social-sharing opportunities. The first step – before you focus on the guest work – is to figure out which sites reach the people you want to reach and which domains offer more credibility to your content and brand. Who is the site’s target audience? Always write with the audience in mind. What are the identified categories and tags for posts? These topics indicate the brand’s SEO and the audience’s intent – potential subject matter for your post. Does the blog include bylines? If it doesn’t, decide whether the site’s value to your brand is sufficient without a byline. How frequently does it publish blog posts? If the blog isn’t updated regularly or frequently, there are fewer opportunities for guest blog posts. TIP: If your strategy calls for guest blogging on multiple sites, put together a spreadsheet to record your answers to these questions for each blog. If your answers indicate the blog is a good fit for your goals, proceed to the next step. 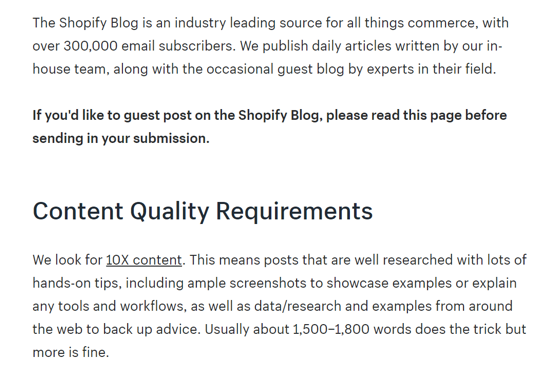 If the site accepts submissions or pitches from potential guest bloggers, it likely offers submission guidelines or at least some basic details on the process. If you’re having trouble finding them, search for “blogging guidelines” and the site name. 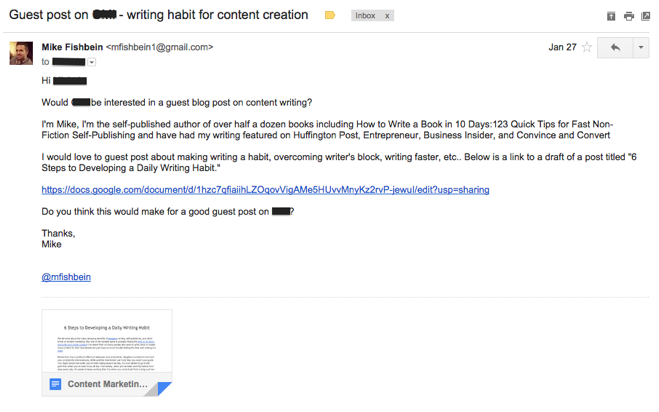 Remember the golden rule of guest blogging? Read the guidelines. Then read them again – beginning to end. If the site asks you to submit an expression of interest form, fill it out as completely as you can. If the site guidelines request a completed article, don’t submit a pitch and if it requests a pitch, don’t submit a completed article. If a bio is requested with the submission, provide one. Believe it or not, following directions really is half the battle to acceptance. With your knowledge of the blog and the brand, including its categories and tags, select a relevant topic. But keep these guidelines in mind. Come up with an uncommon angle, which ensures that your content will provide a fresh take on the topic for the site’s submission reviewer and the audience. TIP: An easy way to review what’s been published on a particular topic is to click on the category or other tags to see all the posts on that subject. Avoid submitting on a radically different topic or format. While experimentation can be smart for your own blog, it’s best to be a guest who wants to fit into your host’s environment. For example, if the blog has never published an infographic, think twice about submitting a standalone infographic as a guest blog post (or, at least ask before you do). And I wouldn’t recommend that you try to convince the brand to expand its focus to your particular format or topic of interest. Your article should fit in seamlessly for the reader, who may or may not know you’re a guest. In addition to matching the blog’s style, write from a reporter’s perspective (not a marketer’s) – provide factual content to inform, educate, or entertain the audience. If you want your submissions to be accepted, don’t think of guest blog posts as disguised ads for selling your products or services or a way to get as many backlinks as possible. Instead, focus on how your article can help the audience. If the blogging guidelines don’t specify a word count, spot-check the length of existing content and find a place in the middle. Writing too long or too short diminishes the likelihood of acceptance. For example, don’t include a statistic quoted by another blog – even if you link to that blog. Go to the native source. If you can’t find the original source for a fact, reconsider using it. Blog submission guidelines often specify the site’s stylebook, whether that’s AP Style, Chicago Manual of Style, etc. In some cases, the guidelines will include the dictionary of choice (yes, not all dictionaries have the same entries). That’s a pain for many sites that must strip formatting to conform to their own style guides. TIP: If the guidelines don’t spell out the review time frame, it’s OK to ask. But when you find out it takes three to four weeks, don’t follow up five days later. Lean more toward following up around four weeks. If you’re asked to revise the post, closely review the comments and questions posed. Decide if you’re willing to make the necessary changes or if you want to withdraw the post and submit the original to another blog site. Let the original blog know if you decide to withdraw. If you decide to revise the post, confirm with the site editors that you will provide a new version by the deadline they assign. Then, make sure you address any feedback sufficiently and entirely. Read through the provided comments several times. When you think you’re done with the revised post, use the feedback as a checklist to verify that you addressed everything requested. You can celebrate when your guest blog post is accepted, but your work isn’t done. 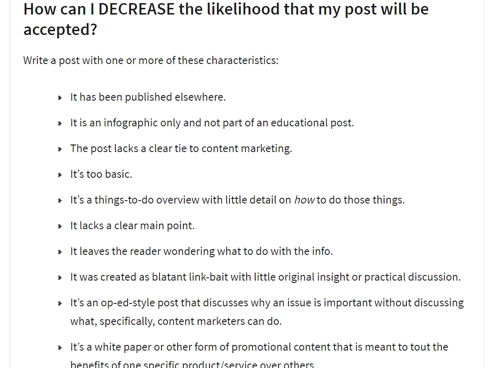 Share your article on appropriate social media channels and include links to the original post like this example from prolific guest blogger Aaron Orendorff. TIP: John Hall suggests promoting your content in relevant LinkedIn groups to drive traffic to the article as well as the publisher’s site. Read and respond to all comments posted on the blog site. Also, track where the article is promoted on social media and interact with any comments posted there. Check in with the blog editor or director. Send a thank-you email or handwritten note right away. Then, in a month or so, reach out to see how well he or she thought the post performed based on the brand’s goals. TIP: Some blogs share publicly the number of direct tweets and shares from the post. Review the performance feedback to evaluate the success of the article. If it didn’t do well, what may have been the hurdle? Was it the headline, audience, topic, approach? If it did do well, track the stats and share in future introductions for other guest blogging opportunities (and even ask the blog editor if he or she would like another post from you). 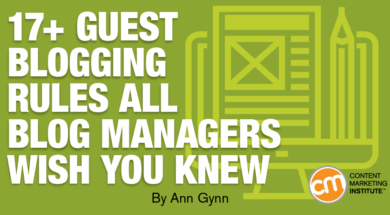 If you see the value in incorporating guest blogging into your content marketing strategy, invest the extra time to be a good guest. By exploring the host blog, creating content around a topic relevant to its audience in an appropriate format, and promoting your post and the site, you’ll exceed your host’s expectations – and you’re likely to receive an invitation to return. Read the contributions from CMI’s guest blogging community to help your content marketing programs. Subscribe to the free daily or weekly digest newsletters.